Over 21 days, starting this Wednesday May 24th 2017, we’ll share aspects of our unique artist worlds as a way to connect and expand. We’ll invite people in to see what being an artist is like for us, what we’ve learned, what we love, what inspires us, what’s not so easy. We’ll talk to each other about what it means to us to be an artist, our dreams and plans. I was intrigued and have decided to go ahead and take part in the challenge. I am curious to see where it may lead in my art journey. I may find some more artists to follow for inspiration and even learn a bit more about myself. For the first day I share Cocoa Spirit and wrote a small bit to go with it. I'm posting this for #21daysinmyartworld as today's prompt of favorite painting. I titled this one Cocoa Spirit because of the process I went through to complete it and for how it feels and looks. It was a very difficult piece for me due to how many months it took for me to finish and some events that occurred over the months. I started drawing on the canvas in April 2016 and finished it September 21, 2016. I remember the date I finished it well because it was exactly one month after my beloved Cocoa passed. I used finishing the painting​ on that day to help heal. The only parts left were his mane and tail. This is my favorite because of the emotion I feel from making the painting and how certain aspects came about. 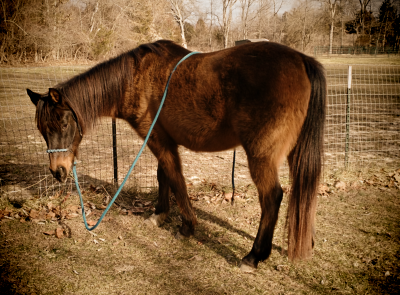 It's become a symbol of my love for a horse that was my heart companion for almost twenty years. For today I think I my last two entries (The Struggles of an Artist Part 1 and Part 2) do a good job of covering for the purposes of mentioning it for a blog post. If you would like to continue to follow my trek through the next 21 days feel free to follow me on Instagram @cfcallier. Since this challenge has just barely started there is still plenty of time to join in (don't forget to use #21daysinmyartworld so others can find your art). Check out Tara Leaver's blog post where you can learn about a few more details and even sign up for an email list. If you sign up for the mailing list you'll get emails every day from Tara Leaver that gives you more information about the day's prompt.